Wigan v Australia - Tour Match. 1967 was not a vintage year for Wigan Rugby League. It was a year in which they finished 17th in the league table, a position that remains our lowest league finish ever. Many players who had been part of success earlier in the decade - like Ray Ashby, Trevor Lake, Laurie Gilfedder and Brian McTigue - were drawing a close to their Wigan careers, whilst the infamous Billy Boston and Eric Ashton partnership was now very vintage. Boston turned 33 in 1967, whilst Ashton was also over 30. The latter was actually player coach by now and probably only his long standing service and reputation at Wigan stopped him getting the sack because Wigan were competing way below the standards they had aspired to throughout their then history. Their was one highlight though in 1967 and that was the visit of the touring Australia team to Wigan on a blustery showery Friday Night in October. The match would have been played on the usual, then traditional, Saturday Afternoon slot but Wigan had recently installed floodlights at Central Park costing £17,500, so cashing in on the new novelty of floodlight rugby league, they played under lights. Hard to imagine Rugby League without floodlights but prior to the mid 60s, floodlit matches were a huge novelty. They first floodlit match of Rugby League involved Wigan back in December 1932, when they faced Leeds in an exhibition match played at White City Stadium in London. It was way outside the heartlands but over 10,000 turned up to watch and this persuaded the owners of White City Stadium invest in a Rugby League team. They bought the Pemberton located "Wigan Highfield" club, who from 1922 to 1932 played alongside Wigan in the league, and moved them to London to become "London Highfield". In 1933-34 they played most of their home matches under floodlit conditions at White City but they only lasted one season before being re-located back north and floodlit rugby wouldn't be seen again for another twenty years. Bradford became the first club up north to try floodlit rugby when they held a game on Halloween in 1951 against New Zealand under lights. Almost 30,000 turned up but the concept still didn't catch on. Wigan's next involvement in floodlit rugby was in 1955 when they took part in a midweek floodlit competition ran, and funded, for broadcast by the new Independent Television contractor for the London region. Eight teams took part in matches played on Soccer Grounds in London but the competition only lasted one season. That idea may not have worked in London but it was resurrected ten years later by David Attenborough who was the programme controller of the recently launched BBC Two. He decided to transmit the second half of Rugby League games every Tuesday from mid October to mid December in a newly launched "BBC 2 Floodlit Trophy". That comp was first run in 1965 but Wigan couldn't take part until Central Park installed floodlights, so that contributed to them being installed in 1967. Prior to floodlights, games had to fit round the sunset. Regular Saturday games normally kicked off at 3 or 3:30pm but as the nights drew in, the kick offs would draw in also to 2:45, 2:30 or 2:15. Then when the nights got lighter those kick offs would reverse back to 3 or 3:30pm. Similar with midweek games. In mid August you could get away with a 7pm kick off but quickly those nights would soon get darker and the kick offs would draw in to 6:30, 6pm, 5:30 or 5pm. Can't imagine huge crowds for those early tea time games, particularly away support must have been non existent. Because of the darkness, midweek games were very rarely seen between November and February because they had to kick off in mid afternoon when everyone was at work. Their were some exceptions. 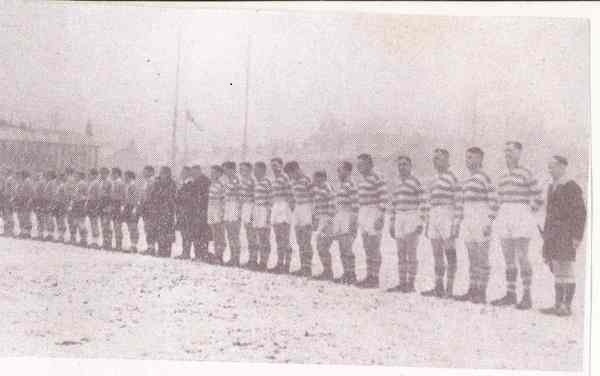 In 1947 Wigan met a touring Carcassonne team at 3pm on a Wednesday Afternoon in March that was played in Blizzard Conditions, whilst Australia's visit to Central Park in 1962 kicked off at 2:30pm on a Monday Afternoon because it had been postponed by fog on the Saturday. Wonder how many bunked off work or school to take in those games? I know my late granddad was at the Carcassonne game. He often tells the true story about the charismatic French Full Back Puig Aubert who was smoking a fag for the entire match and would field balls in one hand whilst retaining the fag in the other. So, floodlights allowed Wigan to play all their day games at 3pm, regardless of the time of year, and all their night games at 7:30pm. Seems daft now but even 7:30 kick offs were a new experience in 1967. Like I explained, games just had never kicked off that late because darkness would fall. The visit of Australia was actually the fourth match played under floodlights at Central Park. The first had been an exhibition against Bradford two weeks earlier which had been set up specifically to test them out. Embarrassingly for the club, the floodlights would fail twice during a match took 98 minutes for the two clubs to battle out a 7-7 draw in front of 12,051 fans. The fans loved it though, even when the lights failed. The fella who asked me to write about this game told me that it was "quite a hoot", which perhaps highlights how exciting the new technology was? In those days a touring party would face a gruelling schedule. On this particular tour the Kangaroos played 27 matches during a 100 day trip between late September and early January. This included three test matches each against both Great Britain and France. Australia actually went on to win the Ashes 2-1 but fail to win any of the three test matches against the French!! The Kanagroos trip to Wigan was the fifth match of the tour. They had begun by beating Warrington at Wilderspool but then they lost to Yorkshire at Wakefield before suffering defeat at Hull KR. They had bounced back to beat Lancashire 14-2 at Salford two days earlier however. Now you have to remember that in those days, these tours were pretty special. No TV coverage from Australia like today, this was one of the rare chances to see the great Australian players like Ken Irvine, Reg Gasnier and Johnny Raper. They all played in the visit to Wigan. I'm not sure if it was by choice, or whatever, but no Wigan players had been involved in the Lancashire match against Australia. This was perhaps because we'd played a league match earlier in the midweek against Batley. The Aussies had 11 of the 13 backing up against Wigan but playing games so quickly in succession was not unusual in those days. Given Wigan's form, that I alluded to earlier, not many will have given us a chance to beat a test team. But that didn't stop 22,357 ramming into Central Park for what was the biggest attendance of the whole tour! Amazingly even bigger than all three attendances for the Ashes Test matches played later in the tour at Headingley, Station Road (Swinton) and at White City Stadium. The key on the night would prove to be injuries to both Stand Offs. Wigan's Cliff Hill came off injured after just 30 minutes to be replaced by his younger brother David. Hill the younger had only joined Wigan 8 days before this match from Liverpool Rugby Union and was making just his second appearance. Meanwhile, Australia's John Gleeson also came off injured but this happened 14 minutes into the second half when the game was in the balance. Australia were holding a 6-5 lead at that point after tries from Scrum Half Billy Smith and winger Johnny King responded to a try and a goal from Eric Ashton. The Guardian Match Report from the time mentions how David Hill and Peter Rowe "often tore big holes in the Australian Defence" but Australia looked like would go on to win the game when Johnny King was sent clear. However referee Joe Manley called a forward pass. Into the final 10 minutes and that 6-5 lead was still being held but Wigan's pack was dominating scrum possession (they were contested in those days) and the pressure finally told when Bill Francis scored with 5 minutes to go. Ashton converted to give Wigan a 10-6 lead, which was added to by a Colin Tyrer penalty late on. So Wigan had won 12-6 and what is the significance of this particular game? Well it was the last time we managed to beat Australia in a tour game. Although we did draw with them five years later in a match that celebrated Wigan's centenary. Australia: 14. Les Johns & 15. Elwyn Walters were both unused.